Our duty of care as dental professionals is to help our patients say yes to necessary and vital dental treatment and care. Once upon a time in a land far away there once existed patients who always said yes to the treatment and care prescribed to them by their dentist. Now patients are being constantly bombarded by information overload with so many choices and decisions to be made, that they become CONFUSED. You now, not only advise patients on the treatment and care they need, you have to ensure your patient is not confused and remove the confusion they may already have before you even see them. This confusion becomes very apparent on the first phone call to your dental office. Once upon a time in a land far away in the beginning of time, a person would call a dental office with a dental concern or problem, make an appointment, keep the appointment and go ahead with treatment and care. This person then became a long-term patient of your dental practice. Now more and more people call a dental office armed with all the information they have gathered which more than often makes the caller confused and unsure about even making the appointment. 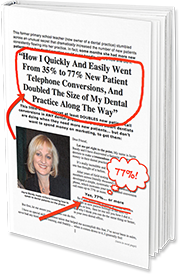 Your job when answering phone in a dental office is now not as simple as just making an appointment. Now you need to know how to handle the caller’s questions and their resistance to making the appointment, even though an appointment is exactly what they need. The caller wants to know how much everything costs, how long it will take, will it last, how much will their health fund give them back, do you offer gap free dentistry, are you open after hours, can they be seen today and much more! The big trap is to start answering the questions straight away on the phone call. It is very hard not to start answering questions, but you must not answer a caller’s question up front. I am not saying you must not answer the caller’s question/s but don’t answer them straight away. Answering the first question you are asked means the caller will probably thank you and end the call. To take the caller from their first question to making an appointment you must find out more about the caller’s dental concern/ problem first then address their questions. The caller wants your help, so help them. Start asking your questions instead. Answering their first question is not going to help the caller, especially if they then end the call before you even get a chance to help them. If you change just this one thing when you answer the call you will be amazed to see the different result you get. You will make more appointments and you will help more patients. Then keep an eye out for my Sydney Master Class on Friday 22nd June 2018.